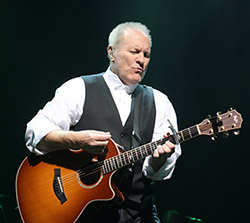 BREMEN, Ga. - Jan. 16, 2019 - PRLog -- Mill Town Music Hall welcomes back one of the great country voices of our time, Collin Raye, on Saturday, February 16 at 7:30pm ET. Collin is a passionate performer, and he has set the country standard when it comes to his soulful delivery of ballads such as "Love, Me," "In This Life," and "Little Rock." Mill Town Music Hall focuses on family-friendly music and events and is located conveniently off I-20 in Bremen (1031 Alabama Avenue). Born in De Queen, Arkansas as Floyd Elliot Wray, Collin Raye catapulted to fame with the song "Love, Me" in 1991. This type of song set the cornerstone for a career built on meaningful and emotional songs that have been used for weddings, anniversaries, memorial services and funerals. In 1994, "Little Rock" became the anthem for those struggling with addiction recovery. Through the years, Raye has charted 16 Number 1 hit songs, among them" My Kind of Girl" and "I Can Still Feel You." He is a 10-time male vocalist of the year nominee (5 CMA and 5 ACM). His latest album was released in 2013, called Still on the Line, which is a tribute album to his longtime friend and country music legend, Glen Campbell. Raye has used his stardom to advance social causes. In 2001, he received the Humanitarian of the Year award during the Country Radio Seminar for his issue-oriented music and his tireless charity work. A Voice Undefeated, Raye's autobiography was released in April of 2014. Tickets for Collin Raye are $40 for Premium Reserved seats and $35 for Reserved seats in advance. Fans are encouraged to purchase tickets through Tickets West at (888) 479-6300, online at the Mill Town Music Hall website (www.MillTownMusicHall.com) or the Mill Town Music Hall box office. For additional information, please call the Mill Town Music Hall box office at 770-537-6455. Upcoming events at Mill Town Music Hall include, The Gatlin Brothers on March 2; Craig Morgan on March 9; Mark Chesnutt on March 16 and Shenandoah featuring Marty Raybon on April 13. For more information about Mill Town Music Hall or an upcoming calendar of events, please visit us at www.MillTownMusicHall.com, follow us on Twitter @Mill_Town_Music_Hall or on Facebook. Mill Town Music Hall can comfortably seat more than 1,000 people and features state-of-the-art audio, video and lighting systems. The venue hosts numerous Country, Pop/Rock, Bluegrass and Gospel concerts, along with other family-friendly events. The facility can also be rented for corporate events and private receptions. Named Large Venue of the Year in 2016 by the Georgia Country Awards, Mill Town Music Hall is committed to providing West Georgia with a quality wholesome entertainment venue. Opened in Feb. 2012, it is the largest facility of its kind in West Georgia and comfortably seats 1,000 people. Featuring state-of-the-art audio, video, and lighting systems, the venue hosts numerous Classic Country, Pop/Rock, Gospel and Bluegrass concerts, along with other family-friendly events. The facility can also be rented for corporate events and private receptions. The venues top sponsors include: Tanner Health System, Systems & Methods Inc. (SMI), R.K. Redding Construction, Synovus Bank, Greystone Power Corporation, Gradick Communications, Aubrey Silvey Enterprises, West Georgia Roofing, Honda Precision Parts of Georgia, Haney Farm and Ranch and Powersports, the Coca-Cola Company, John Thornton Cadillac Buick GMC, West Georgia Technical College, and West Georgia Forklift Repair Service. Please visit www.MillTownMusicHall.com for the most up to date calendar of events.